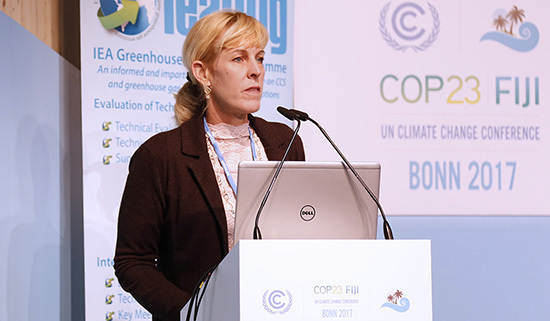 November 6-17, 2017: Gulf Coast Carbon Center, along with IEAGHG, Bellona, and CCSA, hosted the only official UNFCCC Side Event on CCS at COP-23 as well as an exhibit booth at the event. Speaking before the 150 attendees, GCCC's Katherine Romanak explained the evolution of experience gained through the SECARB program, a DOE partnership, monitoring geological storage, which gives confidence to CCS technology. She invited countries interested in exploring their potential for offshore CO2 storage to join an initiative that began as a US DOE-led international project through the Carbon Sequestration Leadership Forum. The entire side event can be viewed online, or for more, please see our blog. October 30, 2017: After 18 months of work, the Society of Petroleum Engineers sub-committee of the Carbon Dioxide Capture, Utilization and Storage Technical Section has released its draft of the Storage Resources Management System (SRMS). Tip Meckel served on the subcommittee. The document establishes technically-based capacity and resources evaluation standards, similar to the PRMS for petroleum. The basis of the SRMS classification scheme is the accessible pore volume in a geologic formation in which CO2 could be stored (i.e., storable quantities). These definitions and guidelines are designed to provide a common reference for the international storage industry, including national reporting and regulatory disclosure agencies, and to support storage-project and portfolio-management requirements. However, the definitions and guidelines contained in this document must not be construed as modifying the interpretation or application of any existing regulatory reporting requirements. 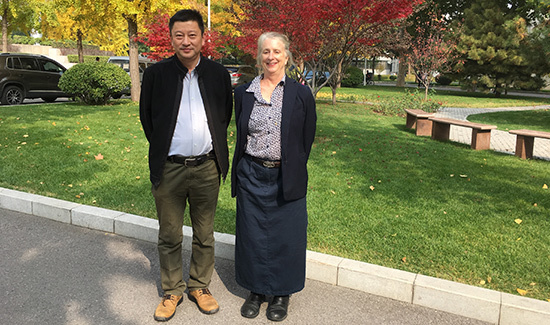 Dr. Peng Bo and Susan Hovorka on the China University of Petroleum campus. Susan Hovorka visits Black Mountain nature preserve, where oil naturally seeps to the surface. September 26-28, 2017: Mission Innovation Carbon Capture Challenge. Tip Meckel, Susan Hovorka and Katherine Romanak participated as technical panelists the meeting co-led by the United States and the Kingdom of Saudi Arabia. Mission Innovation is a paradigm representing the commitment of 22 countries to accelerate clean energy development by doubling their R&D budgets over 5 years. 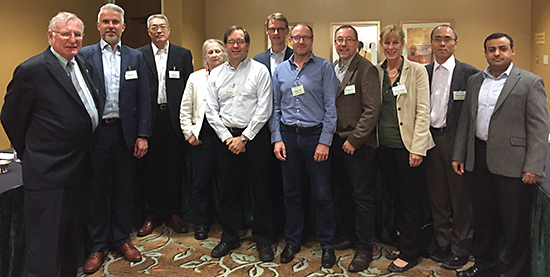 This meeting focused solely on CCS and was attended by 250 invited international participants with expertise in CO2 capture, utilization, and storage. Hovorka and Romanak provided insight into priority research directions (PRD) for monitoring; Meckel participated in defining the PRDs for injectivity and capacity. Other storage panels included well integrity and induced seismicity. The next steps will be to finalize the report in early 2018, which will ideally inform national investment strategies in R&D for accelerating CCS deployment. 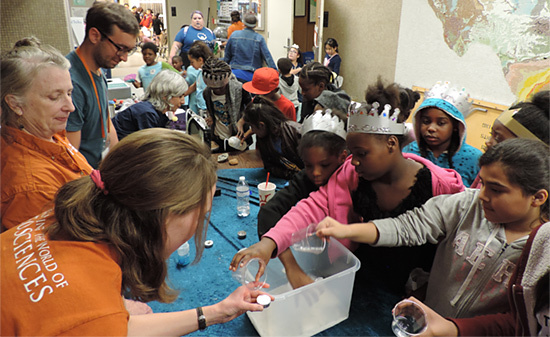 Susan Hovorka and Katherine Romanak participated in the Mission Innovation Challenge. September 22, 2017: GCCC research using 3D seismic data collection at the Tomokamai demonstration storage project in Japan was featured in DOE's Carbon Storage Newsletter. See Page 2 for the write up and details of this innovative and exciting project. July 13, 2017: GCCC bids farewell to Post Doc Luca Trevisan who has conducted excellent research addressing the influence of geologic heterogeneity at the "cm-to-m" scale on subsurface fluid flow of carbon dioxide while working with us. His specific focus was on numerical simulation of fluid flow using both traditional (Darcy) flow simulators as well as Invasion Percolation (IP) methods, with an emphasis on the transition between viscous-dominated and buoyancy/capillary-dominated flow regimes. 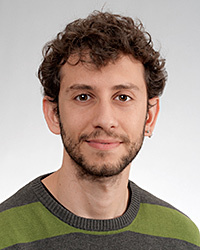 GCCC wishes Luca continued success in his next postdoctoral position at the Institute for Hydromechanics, Karlsruhe Institute of Technology, Karlsruhe, Germany. July 13, 2017: This summer, the Gulf Coast Carbon Center is thrilled to work with three outstanding graduate students, Amir Kamali from the University of Oklahoma and Alexander Tarakanov and Mehrdad Alfi from Texas A&M University. The students' research is being overseen by Seyyed Hosseini. Please see our blog for more about their work. June 29, 2017: Ph.D. Student Prasanna Krishnamurthy and Tip Meckel along with their co-authors have published, "Comparison of Darcy's law and invasion percolation simulations with buoyancy-driven CO2-brine multiphase flow in a heterogeneous sandstone core" in the Journal of Petroleum Science and Engineering. This publication is an important step in understanding how our assumptions related to multi-phase fluid flow that are inherent in different numerical simulation approaches affect our perceptions of flow and saturation. Sue Hovorka with award-winning CAGS students. 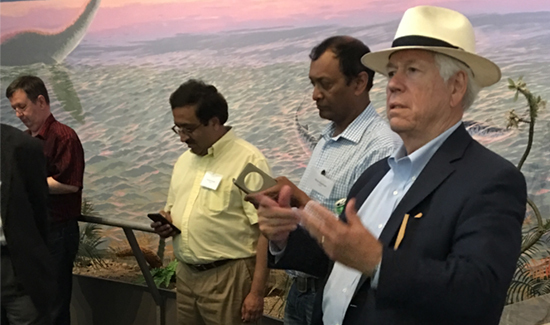 June 19-21, 2017: GCCC hosted three events focused on fostering opportunities for local and international collaboration on geological carbon sequestration in the Gulf Coast. 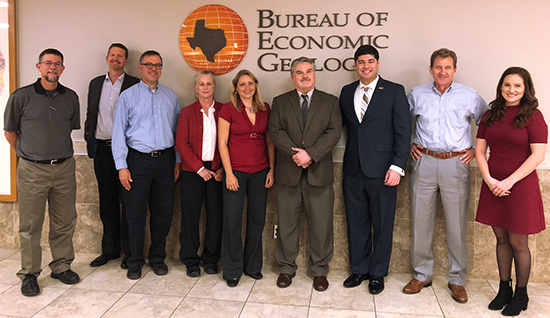 Katherine Romanak and Tim Dixon facilitated the Second International Workshop on Offshore Geologic CO2 Storage at the Center for Innovation, Commercialization and Entrepreneurship at Lamar University. Stakeholders from China, South Africa, Japan, Norway, France, the Netherlands, UK, Canada, and across the United States attended. Elements of this event were supported by CSLF. Tip Meckel led a field trip that incorporated aspects of the full CCS chain: a tour of the Air Products capture facility, overviews of a midstream transport terminal including rail, vessel and pipeline transport, highlights of modern analogues of storage formations at the Texas coast, and a visit to the museum of the Gulf Coast, Port Arthur Texas. 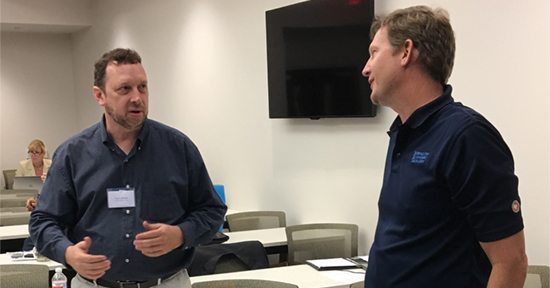 As part of the CarbonSAFE project, the event wrapped up with a workshop and open house exploring the connections and opportunities between carbon sources and sinks in the Gulf Coast hosted by Lamar University. The Department of Energy is supporting the CarbonSAFE project to look at implementing carbon capture and storage technology in the Golden Triangle Area (Beaumont-Port Arthur-Orange) of South East Texas. GCCC thanks Bart Owens of GT-Omniport for generously providing lunch at their facilities on the field trip, Jeff Hayes of Port Arthur for his support for the dinner on Tuesday night, and Tom Neal, the Director at the Museum of the Gulf Coast. For additional information, please click here. Click photos below to view larger. Tip Meckel with Bart Owens at GT-Omniport who generously provided lunch at their facilities during the field trip. 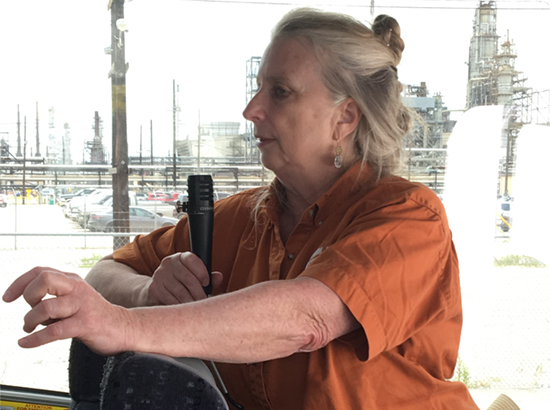 Sue Hovorka commenting on field trip at the Air Products carbon capture demonstration project in Port Arthur. The CO2 is transported via the Denberry green pipeline Texas for injection into the West Hastings unit, an enhanced oil recovery project in Texas. Jeff Hayes of Port Arthur graciously provided dinner for the group on Tuesday night during a tour of the Museum of the Gulf Coast in Port Arthur. 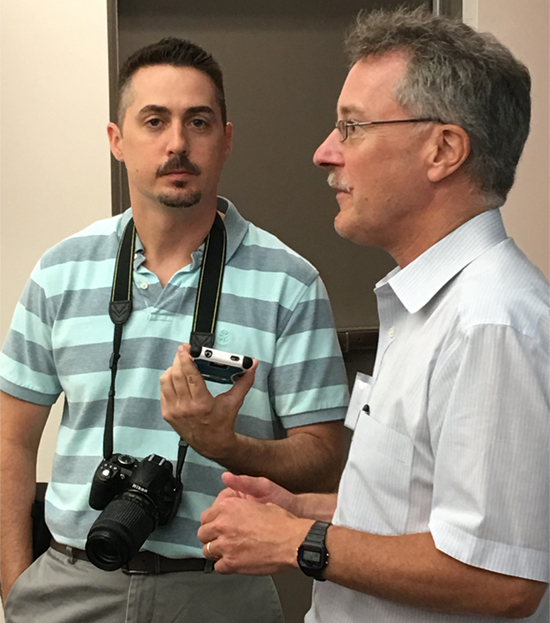 Tim Dixon of IEAGHG talks to a local reporter about carbon storage during the CarbonSAFE meeting at Lamar University. 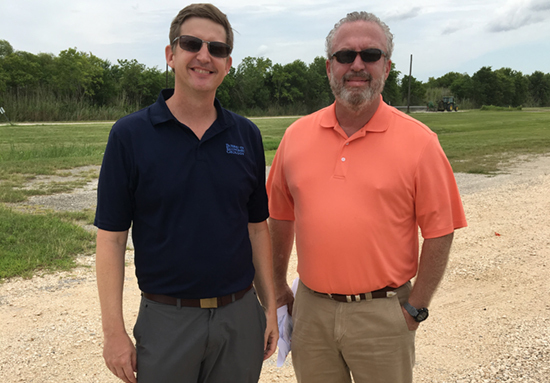 Paul Latiolais, Director of the Center for Innovation and Commercialization at Lamar University, welcomes Tip Meckel to the facilities at the center. Tip Meckel discussing offshore options for carbon storage during the CarbonSAFE meeting at Lamar University. June 13-15, 2017: 11th IEAGHG Monitoring Network Meeting. Susan Hovorka and Katherine Romanak served on the organizing committee. They developed and presented a new interactive group exercise to let monitoring experts practice determining whether a possible leakage signal detected at a storage site must be attributed to leakage from the reservoir or an change unrelated to the project. Susan Hovorka gave a talk on "Monitoring design for commercial EOR: plans now deployed at a site for large volume CO2 EOR with associated storage." 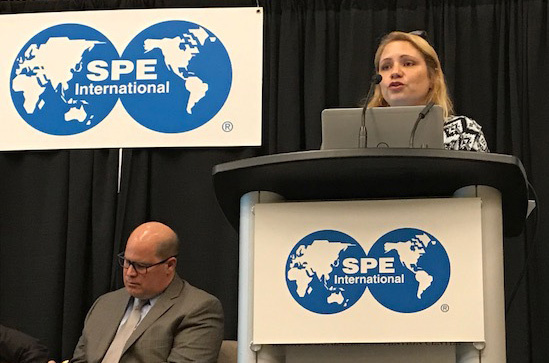 Katherine Romanak organized and presented at a panel discussion on "Near surface/surface baseline monitoring commonalities/site-specific subtleties and leakage monitoring." Travers City, Michigan. May 21-26, 2017: CO2 Summit of Engineering Conferences International Series, Pathways to Carbon Capture, Utilization, and Storage Deployment. 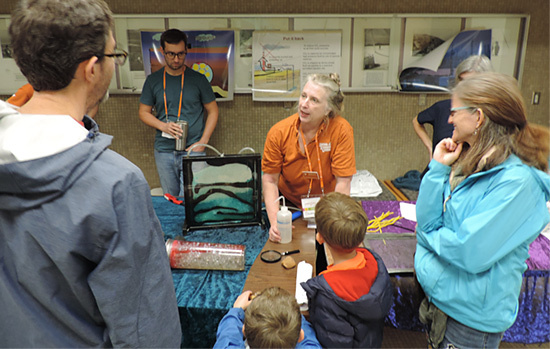 Susan Hovorka attended and presented SECARB results in paper titled "Carbon Capture and geologic sequestration from intermittent use of fossil fuels" and "Status, Challenges, and potential capacity of reliable geologic storage of CO2." Centaro, Calabria, Italy. 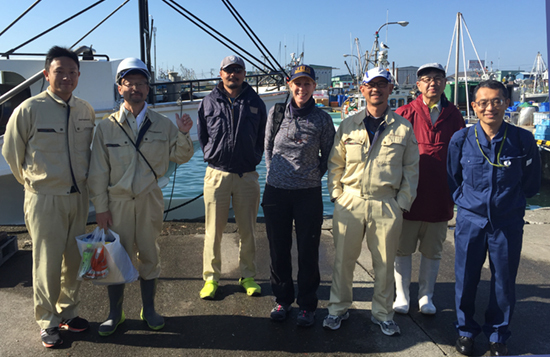 May 17-23, 2017: Katherine Romanak traveled to Japan to collaborate with researchers at the Tomakomai storage project, collecting data on water column monitoring. Forty-five attendees as well as Susan Hovorka (front third from left) and Seyyed Hosseini (front left) attended the CCS workshop in Mexico City. Vanessa Nunez-Lopez (on the screen) attended by teleconference from Austin. March 14, 2017: Congratulations to Luca Trevisan and Tip Meckel, who along with co-author Tissa H. Illangasekare have published a paper, "Modelling plume behavior through a heterogeneous sand pack using a commercial invasion percolation model," in the journal Geomechanics and Geophysics for Geo-Energy and Geo-Resources. The study considers CO2 flow patterns from a physical model of a well-characterized sand aquifer saturated with a brine-analog. The observed plume distribution appears to be controlled by a combination of buoyant migration and trapping at capillary barriers under near-hydrostatic pressure conditions. March 4, 2017: ExploreUT. 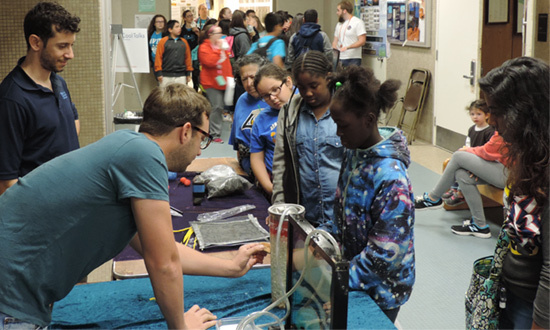 GCCC delighted attendees of The University of Texas at Austin's giant open house with our booth called "What to do with CO2?" Emily Beckham, Susan Hovorka, Jacob Anderson, Nairia Fernandez, and Luca Trevisan gave hands on demonstrations showing the curious physical properties of carbon dioxide and how we can use those properties to keep carbon dioxide out of the atmosphere by storing safely in geological formations. February 24-March 7, 2017: Katherine Romanak traveled to Queensland, Australia to provide expertise and conduct research in environmental monitoring for the Carbon Transport and Storage Corporation Pty Ltd (CTSCo) Surat CCS demonstration project. The project is designed to demonstrate the technical viability, integration and safe operation of Carbon Capture and Storage (CCS) in the Surat Basin. Currently in the feasibility study stage, the project is undergoing assessments and approvals in environmental, social and technical aspects, under the relevant government regulation. Romanak's research project is funded by the Australian National Low Emissions Coal Research and Development Ltd (ANLEC R&D) on behalf of the Australian coal industry and the Australian Commonwealth government. This project will support compliance with environmental requirements for Monitoring and Verification (M&V), including early communication with CTSCo Surat Basin Project stakeholders. The research will help to define a way forward for environmental monitoring at the CTSCo Surat Basin project site and ultimately at project sites within other Australian sedimentary basins, The hypothesis being tested is that simple soil gas ratios can be used for real-time accurate environmental signal attribution, even in hydrocarbon-rich environments. Also being tested is the degree to which isotopes can be used for signal attribution. This research will give an indication of the most useful methods for environmental compliance and near-surface (M&V) at the CTSCo Surat CCS demonstration project and beyond. 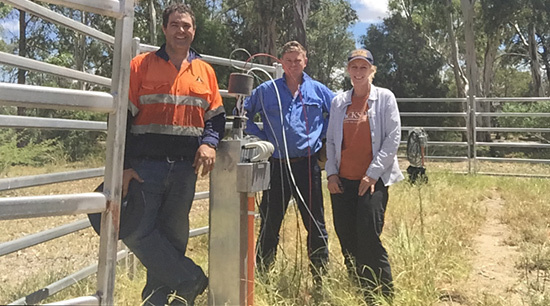 Paul Jensen (ALS Laboratory group), Nick Hudson (CTSCo) and Katherine Romanak (BEG) stand beside one of the soil gas stations being used for real-time environmental monitoring at the Surat Basin CCS demonstration site. 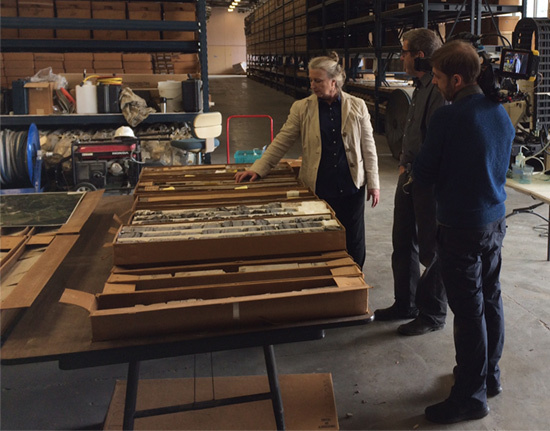 The project is upscaling and improving on Romanak's initial design for using commercially available sensors for real-time data collection at CO2 geological storage sites. (e.g. Romanak et al., 2014, Energy Procedia 63 ( 2014 ) 4027 – 4030 and Romanak et.al., 2015, Chapter 37, in Gerdes, K. F., ed., Carbon dioxide capture for storage in deep geological formations--results from the CO2 Capture Project, Volume 4: CCS Technology Development and Demonstration Results (2009-2014): UK, CPL Press and BP, p. 705-732. February 21, 2017: Congratulations to GCCC authors for the publication of several new articles. Ramon Treviño and Tip Meckel published a new paper with co-author Alexander Kolkov, "Diffraction imaging for seal evaluation using ultra high resolution 3D seismic data" in Marine and Petroleum Geology. The paper discusses high resolution P-cable seismic imagery of the sealing properties of cap rock. Hoonyoung Jeong and Sanjay Srinivasan published "Fast Assessment of CO2 Plume Characteristics Using a Connectivity Based Proxy" in the International Journal of Greenhouse Gas Control. The paper proposes a method for decreasing computational cost of estimating uncertainty in the extent of CO2 plumes during in injection by 90%. J.P. Nicot and Alexander Sun along with Rebecca Gao published "Identification of a representative dataset for long-term monitoring at the Weyburn CO2-injection enhanced oil recovery site, Saskatchewan, Canada" in the International Journal of Greenhouse Gas Control. With a unit of the Weyburn injection site as an example, the researchers used an attribute-based unit supervised classification to decimate a dataset and showed that ~80% of the wells can be removed with no negative impact on the simulated pressure field. Alex Sun, Akand Islam, and Mary Wheeler published "Identifying attributes of CO2 leakage zones in shallow aquifers using a parametric level set method" in Greenhouse Gases: Science and Technology. The work applies a parametric level set (PaLS) method to characterize leak zones. 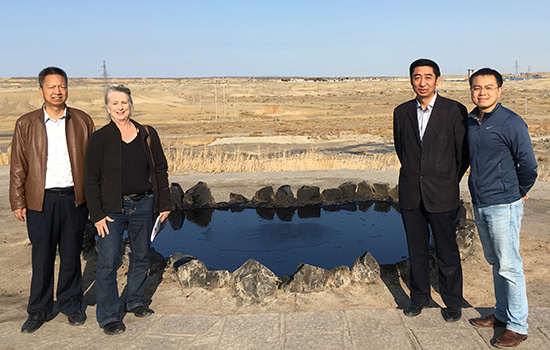 Changbing Yang, Katherine Romanak, and Susan Hovorka, along with their co-author Robert Reedy published Soil gas dynamics monitoring at a CO2-EOR site for leakage detection in Geomechanics and Geophysics for Geo-Energy and Geo-Resources. The paper describes a comprehensive soil gas monitoring program was conducted at a CO2-enhanced oil recovery site in western Mississippi to validate near-surface monitoring technologies for CO2 leakage detection. February 1, 2017: Security & Sustainability Forum: Restoring the Carbon Balance - Session 2: The technologies. Susan Hovorka will participate in this webinar sponsored by LightWorks at Arizona State University. Other participants include Klaus Lackner, Director of the Center for Negative Carbon Emissions at Arizona State University and Joel Makower, chairman and executive editor of GreenBiz Group Inc. The series is about taking research steps now to have technologies commercially available in the next decade or so, which can cost-effectively extract residual carbon from the air. According to the International Panel on Climate Change, that is what it will take to avoid the worst climate disruptions. In this webinar, the experts will be discussing the status of negative carbon technologies that could spell the difference, in the next decade, in meeting climate goals. The webinar will take place from 1 to 2 pm EST on February 1, 2017. Registration is free, but required. January 19, 2017: Congratulations to Luca Trevisan for the publication of two new papers this month. "Imaging and quantification of spreading and trapping of carbon dioxide in saline aquifers using meter-scale laboratory experiments" and "Investigation of representing hysteresis in macroscopic models of two-phase flow in porous media using intermediate scale experimental data" were both published in Water Resources Research.